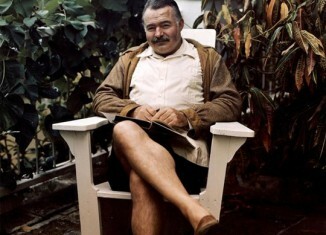 Hemingway said he “was out of business as a writer” from 1942 to 1945. In 1946 he married Mary, who had an ectopic pregnancy five months later. The Hemingway family suffered a series of accidents and health problems in the years following the war: in a 1945 car accident, he “smashed his knee” and sustained another “deep wound on his forehead”; Mary broke first her right ankle and then her left in successive skiing accidents. A 1947 car accident left Patrick with a head wound and severely ill.
Hemingway sank into depression as his literary friends began to die: in 1939 William Butler Yeats and Ford Madox Ford; in 1940 Scott Fitzgerald; in 1941 Sherwood Anderson and James Joyce; in 1946 Gertrude Stein; and the following year in 1947, Max Perkins, Hemingway’s long-time Scribner’s editor and friend. During this period, he suffered from severe headaches, high blood pressure, weight problems, and eventually diabetes—much of which was the result of previous accidents and many years of heavy drinking. Nonetheless, in January 1946, he began work on The Garden of Eden, finishing 800 pages by June. During the post–war years, he also began work on a trilogy tentatively titled “The Land”, “The Sea” and “The Air”, which he wanted to combine in one novel titled The Sea Book. However, both projects stalled, and Mellow says that Hemingway’s inability to continue was “a symptom of his troubles” during these years.